Engineered for those affected by presbyopia, bifocal multifocal progressive contact lenses supply sharp focus on objects at all distances. Thanks to recent advances in optical technology, this type of lens enables the viewer to experience uninterrupted visual acuity at all times. No more blurriness when swapping between reading fine print up close and signs in the distance. Bifocal multifocal progressive contact lenses live up to their name by offering the wearer freedom from having to rely on and swap between two pairs of glasses. One sophisticated lens can do the job of both in one go. Bifocal multifocal progressive lenses are made by some of the leading optical health manufacturers, including Ciba Vision and Bausch & Lomb. Choose between gas permeable and soft contact lenses. 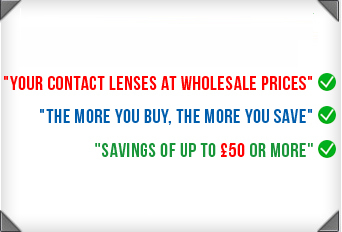 Gas permeable are rigid and can take a bit of getting used to, whilst soft lenses are now more commonly used because of their smoothness, flexibility and comfort. Opt for a daily disposable and you can throw away after each way. Go for a monthly disposable and you will have to follow a cleaning routine. However, you will be able to remove and then re-apply in one day. They are synonymous with quality and are designed especially for older eyes, which are often prone to dryness and irritation. So, in addition to impeccable visual acuity at objects up close, mid-distance and far away, you get a lens which supports eye health too. Bifocal multifocal progressives tend to have a higher water content than standard lenses, which means better breathability and higher resistance to protein and deposit build-up. More oxygen can pass through to the cornea, keeping eyes feeling moist and clear all day.